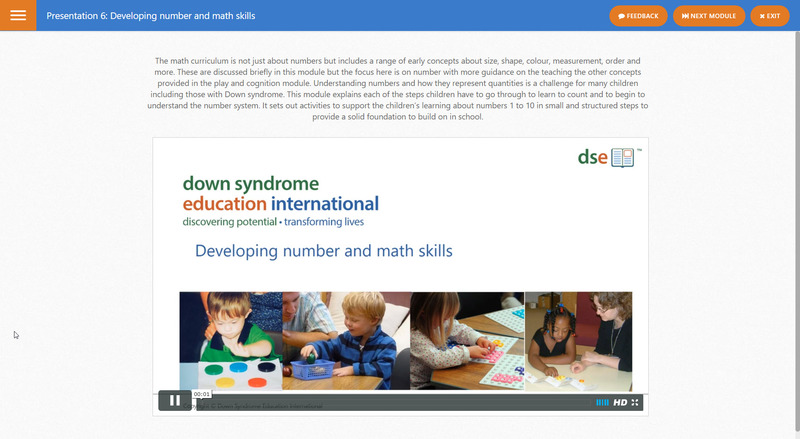 Our online training courses offer convenient access to up-to-date information and evidence-based, practical guidance for parents, teachers and therapists supporting children with Down syndrome. Each course includes a series of modules, each of which includes a video presentation, handouts and an assessment. 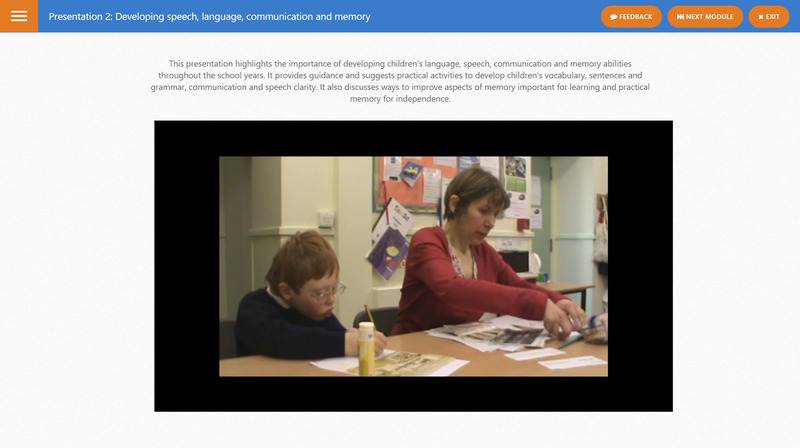 The video presentations can be viewed online, handouts downloaded and assessments completed at any time. In addition, course participants are invited to join a discussion forum with DSE tutors for the opportunity to ask questions and seek additional advice. Our training services are underpinned by over 35 years of research and practical experience supporting children with Down syndrome, their families and educators around the world. Developed and led by Professor Sue Buckley OBE - a recognised leader in education research for children with Down syndrome - our courses are rigorously grounded in the scientific understanding of the learning needs of children with Down syndrome. At the same time our services are firmly focused on practical advice designed to improve outcomes for children with Down syndrome at home and in the classroom. Our online courses provide participants with an understanding of the latest research and its practical implications. 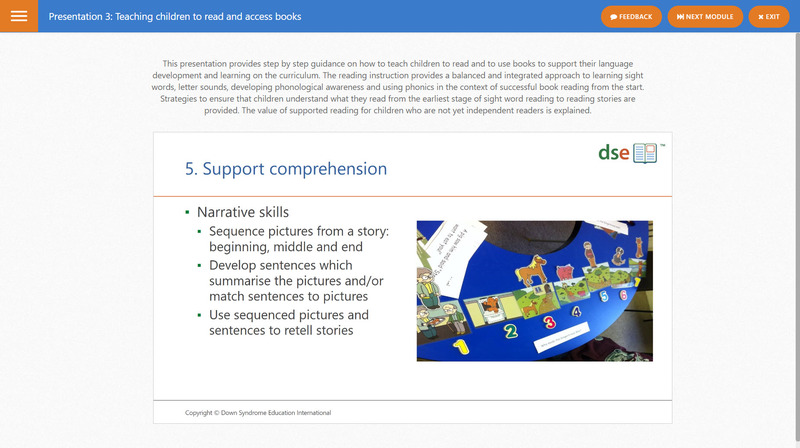 They also offer extensive practical guidance on teaching and learning across the curriculum with many examples of children's progress provided in video clips and work examples from our extensive experience of supporting early intervention and education in schools since the 1980s. Children with Down syndrome progress at varying rates with, for example, some reading at 6 year of age others starting to read in their teenage years. Our courses provide practical advice and work examples for teaching children and supporting their development across the age range, and are designed to take account of the wide range of individual differences in rates of progress and educational needs seen in the population of children with Down syndrome. Our online courses are accessible via the Internet using any modern web browser on a variety of computers and tablets. We recommend using the latest versions of Microsoft Edge, Google Chrome, Mozilla Firefox or Apple Safari web browsers. We also recommend you use a high speed Internet connection when streaming video presentations. You will need a device with speakers or headphones to listen to the pre-recorded presentations.